Back to the campground. 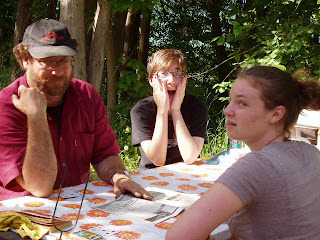 Yes, I still had to feed the family even while they were taking a break. 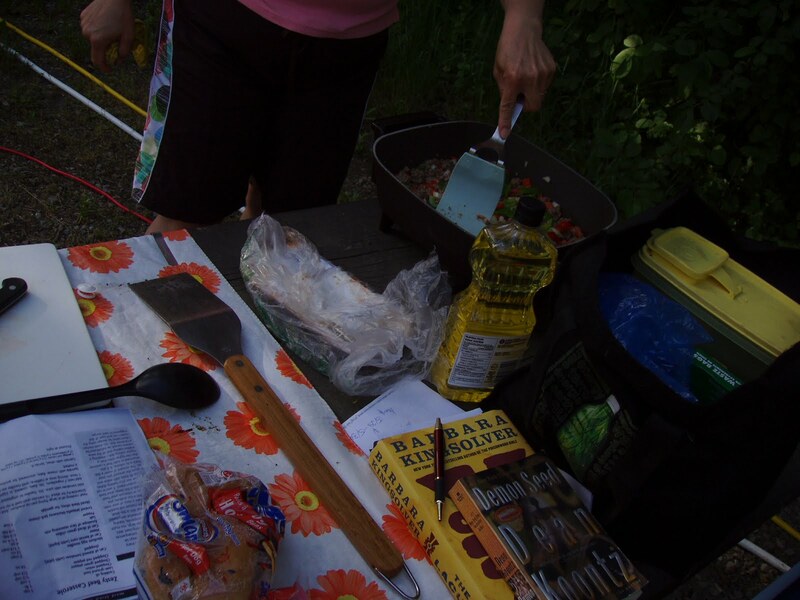 Last year all our cooking was done over the fire. Enough of that phooey. This year we are taking appliances: crockpot, electric frying pan, electric grill, and next time even the capaccino machine etc. It took a bit of searching in the cookbooks to find a casserole that could all be done without the oven. I figure that putting the lid on the deep dish frying pan would sort of work out and it did. In the first picture is hubby, daughter who is hamming it up and her friend. They were fed well all weekend even though we had to make a trip to Collingwood to pick up pie. Friend had brought an awesome apple pie but it inadvertantly got left on the kitchen table. That sure made us sad. Picture two shows a general table shot, notice the books that I reviewed earlier this week sitting near the bottom of the photo. I have made a few things out of Company's Coming: Most Loved Cassroles, though this was the first time for this one. We have put this one on the repeat list, though with more black olives for topping and even more cheese. My daughter took pictures of me making "Zesty Beef Casserole". 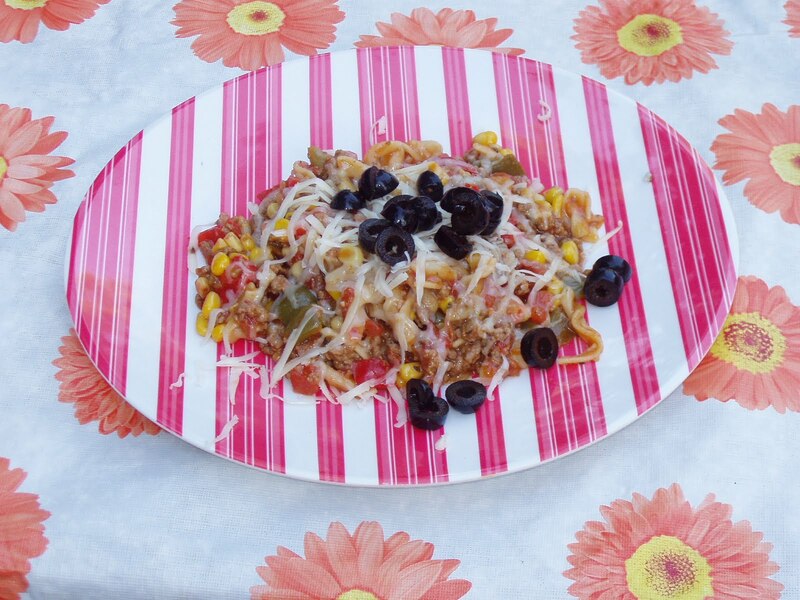 (click on the recipe name for a printable copy) It was very easy and wonderfully tasty. My only change from the directions was to cook for about 1/2 an hour in the skillet with the lid on instead of in the over for 1 hour. The recipe does call for a package of taco seasoning. I find packages too salty, and choose to make my own mix instead. Mix together and store in a sealed container. Use approximately one tablespoon per pound of beef. 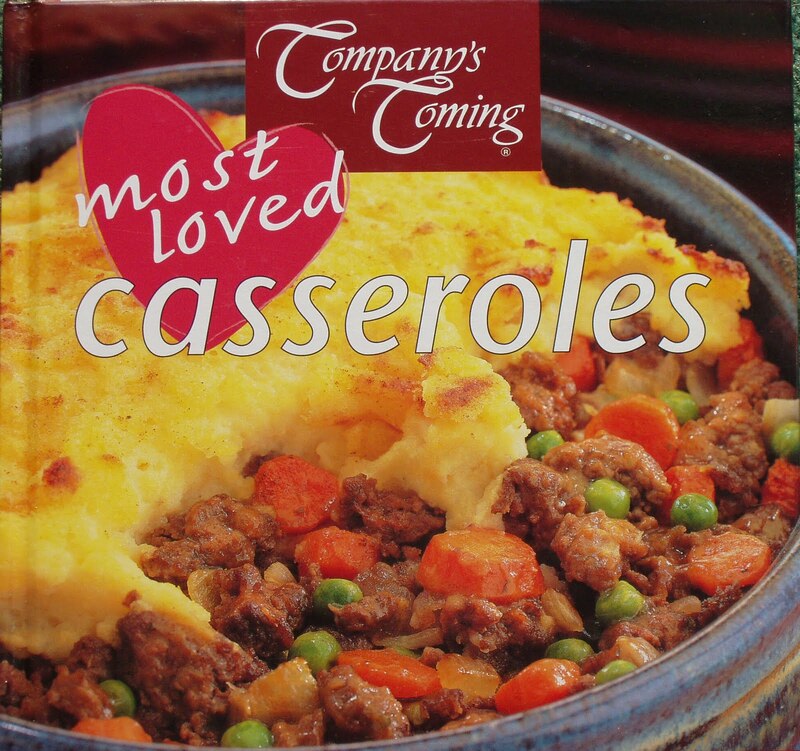 I used about two tablespoons in the "Zesty Beef Casserole". Daughter rounded out our meal with a lovely fresh fruit salad that included strawberries, blackberries, and raspberries, and for juice added a can of baby oranges. 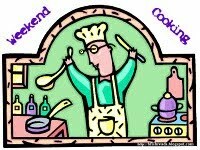 Click on over to Beth Fish Reads to her "Weekend Cooking" meme. Visit all the food related postings for the week and add your own. Beth is also hosting a contest this week to win a yummy sounding cookbook and a 3 month foodie membership to The Six O'clock Scramble. Now that's what I call camp food! 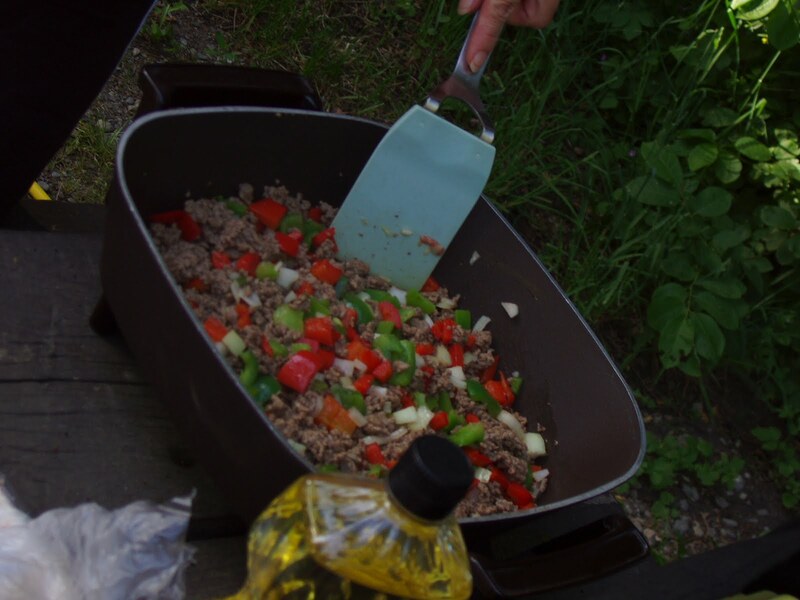 Cooking over a fire gets old fast -- we take a camp stove so it's like cooking over a gas range. But bringing a crockpot sounds like a good idea. Thanks for the recipe and the heads-up on the cookbook. I love to camp but I like campfire cooking in limited quantities - like maybe hotdogs. We've used a camp stove in the past but now only camp in our RV. I use my crockpot for baking also. I've done cakes, breads, muffins, etc. You might check that out for future camping trips. The "Zesty Beef Casserole" looks gooood! That Mexican taco bake sure looks good. 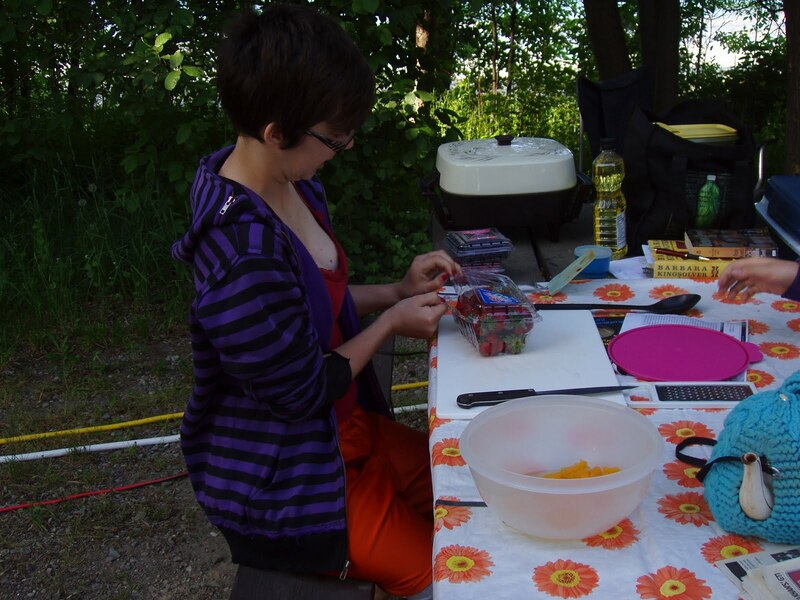 It is much fancier fare than I would think of for camping menues! Even though we now have a travel trailer with a full kitchen, we still set up an outside kitchen and use it for about 80% of our cooking. And I never leave hiome with out a crockpot and slow cooker! I am going to have to check out this book for some ideas! I'm going to have to check this one out. I looove casseroles...the ultimate comfort food for me! I need to make me some casseroles. Yummy!